273-279 Clarendon are located on the NE corner of Clarendon and Marlborough, with 285 Clarendon (201 Beacon) to the north, across Alley 420, 92 Marlborough to the south, across Marlborough, 89 Marlborough to the east, and 274 Clarendon to the west, across Clarendon..
273-275-277-279 Clarendon and 91 Marlborough (271 Clarendon) were built ca. 1869 for building contractor George Wheatland, Jr., for speculative sale. They form a single unit between Marlborough Street and Public Alley 420. George Wheatland, Jr., acquired the land for 273-279 Clarendon and 91 Marlborough on February 27, 1869, from attorney William Everett. He had assembled the parcel by purchasing four lots between February and April of 1866, with a combined frontage on Marlborough of 103 feet. 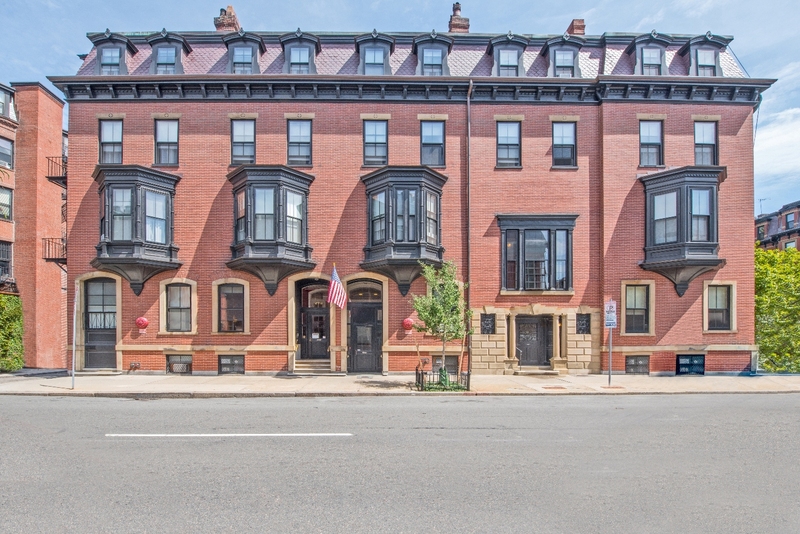 He then built 89 Marlborough on the eastern lot with an 18 foot frontage and sold the remaining lot with an 85 foot frontage to George Wheatland, Jr. The original four lots had been purchased from the Commonwealth of Massachusetts on June 27, 1863, by Nathaniel L. Williams; on November 3, 1863, by Francis E. Parker; on January 9, 1864, by John Lowell Gardner; and on April 12, 1866, by William Everett. The original deeds for 273-279 Clarendon provided a four foot wide easement at the eastern edge of the lots at 275-277-279 Clarendon running north from the boundary line between 273 and 275 Clarendon to provide the four houses with access to the alley. When 89 Marlborough was built ca. 1867, the western wall was placed half on the lot for 89 Marlborough and half on the adjoining lot to the west, as was customary for party walls. The houses built by George Wheatland, Jr., were built as a block facing Clarendon and did not utilize the western wall of 89 Marlborough as a party wall. Accordingly, on March 1, 1869, Jacob Rogers acquired the six inch strip of land land and western half of the wall on it from George Wheatland, Jr., decreasing the depth of the lots for 273-279 Clarendon and 91 Marlborough to 84 feet 6 inches. In a letter dated July 10, 1869, from architect Charles Brigham to Edward Boit, the first owner of 91 Marlborough, Brigham — who had been retained by Boit to make modifications in the house — comments that the original architect of 91 Marlborough was Frank Jackson. From this, it can be concluded that Frank Jackson probably also designed 273-279 Clarendon. It appears likely that the Frank Jackson referred to by Brigham was Francis Henry Jackson, who was a real estate dealer but also identified himself as an architect in the 1860 US Census (there is no architect named Jackson with a first name beginning with “F” listed in the Boston City Directories for the 1868-1872 period). Originally occupied as five separate houses, over the years 273-279 Clarendon and 91 Marlborough were combined for use as a residence for seniors, first Morville House and then and Hale House. 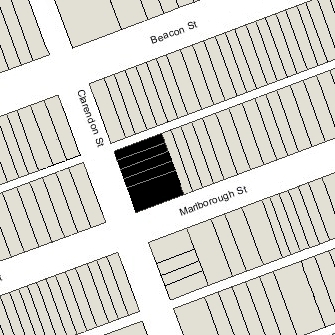 91 Marlborough and 273 Clarendon were the first to be combined. 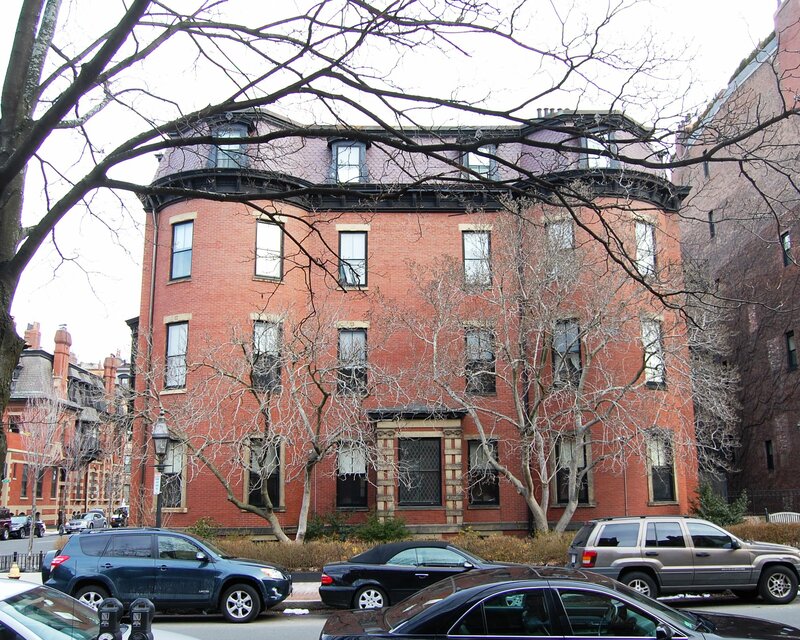 In June of 1888, Augustus and Harriet Dexter (Lawrence) Hemenway, who lived at 91 Marlborough, bought 273 Clarendon. In 1890, they combined the two houses with the entrance at 273 Clarendon. In December of 1935, the Episcopal City Mission acquired 273 Clarendon, and in December of 1937, it acquired 275 Clarendon. It converted both houses into a home for aged women, called Morville House. In October of 1945, the Episcopal City Mission acquired 279 Clarendon, which it operated as the Morville House Annex. And in November of 1962, it acquired 277 Clarendon, completing its acquisition of the entire block of properties. The Mission continued to operate 273-275-277-279 Clarendon as Morville House until the early 1970s when it moved to 100 Norway Street. On January 29, 1973, 273-275-277-279 Clarendon were acquired by Edward Everett Hale House, Inc., affiliated with the First Church Boston (southwest corner of Marlborough and Berkeley). In June of 1974, it filed for (and subsequently received) permission to convert the legal occupancy of all of the buildings from “boarding home” to “rest home,” to be called Hale House. In December of 1978, it applied for (and subsequently received) permission to combine the properties into one property, with the address of 273 Clarendon. In June of 1984, the Edward Everett Hale House, Inc., changed its name to Hale-Barnard Corporation. 273 Clarendon remained the Hale House residence for seniors in 2015. 91 Marlborough was purchased from George Wheatland, Jr., on February 24, 1870, by a trust created by John Perkins Cushing for his daughter, Mary Louisa (Cushing) Boit, the wife of Edward Darley Boit, Jr. In 1868, the Boits had lived at 30 Marlborough with his parents, Edward Darley Boit and Jane Parkinson (Hubbard) Boit, but had moved to 1 Mt. Vernon Place in 1869. They also maintained a home, The Rocks, in Newport. Click here for an index to the deeds for 91 Marlborough. In 1870, probably before occupying 91 Marlborough, the Boits had additional work done under the direction of architect Charles Brigham, who had designed their Newport home. The work included the addition of tiles to the fireplace, library fittings, and probably other work. The carpentry work was done by Thomas J. Turner. Edward Boit was an attorney by training who gave up the law to become a painter. His brother-in-law and sister, Arthur and Jane (Boit) Hunnewell, lived next door, at 273 Clarendon. The Boits continued to live at 91 Marlborough in 1872, but moved soon thereafter to Europe. On October 28. 1873, 91 Marlborough was purchased from Mary Louisa Boit’s trustees by trustees for the benefit of Marian (“Clover”) (Hooper) Adams, the wife of Henry Brooks Adams. She had established the trust on December 1, 1864, to manage her inheritance from her grandfather, William Sturgis. The trustees were her father, Dr. Robert William Hooper, a physician, and her brother, Edward William Hooper, an attorney. Her mother, Ellen (Sturgis) Hooper had died in November of 1848. Henry Brooks Adams was professor of medieval history at Harvard and would become a noted historian, novelist, and essayist. They had married in June of 1872, after which they traveled in Europe, and 91 Marlborough probably was their first home together. They continued to live there until 1877, when they moved to Washington, DC. They continued to own 91 Marlborough and may have spent a part of the winter seasons there (they were listed there in the Blue Books through 1880). In 1880, 91 Marlborough was briefly the home of banker Walter Hunnewell and his wife, Jane Appleton (Peele) Hunnewell. Their primary residence was in Wellesley. By the 1880-1881 winter season, they had moved to 303 Dartmouth, the home of his brother and sister-in-law, Arthur and Jane Hubbard (Boit) Hunnewell, who were traveling in Europe. Arthur and Jane Hunnewell had been the first owners of 273 Clarendon, next door; she was the sister of Edward Darley Boit, Jr. By the 1882-1883 season, Walter and Jane Hunnewell were living at a new home they had built at 261 Commonwealth. On October 21, 1880, 91 Marlborough was purchased from Marian Adams’s trustees by William Sohier Dexter, trustee for Gertrude (Lawrence) Peabody, the wife of retired merchant and banker John Endicott Peabody. They previously had lived in Salem. They continued to live at 91 Marlborough in 1882, but had moved to 80 Commonwealth by the 1882-1883 season. On May 15, 1882, 91 Marlborough was acquired from Gertrude Peabody’s trust by Augustus Hemenway, a trustee of estates. He and his wife, Harriet (Harriett) Dexter (Lawrence) Hemenway, had married in December of 1881 and 91 Marlborough probably was their first home together. Before their marriage, he had lived at 40 Mt Vernon with his mother, Mary (Tileston) Hemenway, the widow of Edward Augustus Holyoke Hemenway. Augustus and Harriet Hemenways also maintained a home and farm in Canton. On May 8, 1884, Augustus Hemenway transferred 91 Marlborough into his wife’s name. In June of 1888, he purchased 273 Clarendon, next door. In 1890 they combined the two houses, converting the entrance at 91 Marlborough into a bay window and rebuilding the entrance at 273 Clarendon, which became the address of the combined property. While the houses were under construction, the Hemenways lived temporarily at 151 Commonwealth. 273 Clarendon was purchased from George Wheatland, Jr., on February 24, 1870, by banker Arthur Hunnewell. In June of 1870, he married Jane Hubbard (Boit) Hunnewell, and they made it their home. Jane (Boit) Hunnewell’s brother and sister-in-law, Edward Darley Boit, Jr., and Mary Louisa (Cushing) Boit, lived next door, at 91 Marlborough, which they had purchased on the same day as Arthur Hunnewell bought 273 Clarendon. Click here for an index to the deeds for 273 Clarendon. The Hunnewells continued to live at 273 Clarendon until about 1877, when they moved to a new home they had built at 303 Dartmouth. On May 7, 1877, 273 Clarendon was purchased from Arthur Hunnewell by Agnes Russell (Elwood) Devens, the wife of Arthur Lithgow Devens, Jr. They had married in December of 1876 and 273 Clarendon probably was their first home together. Arthur Devens, Jr., was a wholesale dry goods merchant and later would become a banker and broker. They continued to live at 273 Clarendon during the 1881-1882 winter season, but moved thereafter to 77 Marlborough. On November 22, 1881, 273 Clarendon was purchased from Agnes Devens by Sarah Maria (Parker) Cunningham, the widow of shipping merchant Frederic Cunningham. She previously had lived at 229 Beacon with her son and daughter-in-law, Stanley and Mary Ann (Crehore) Cunningham. 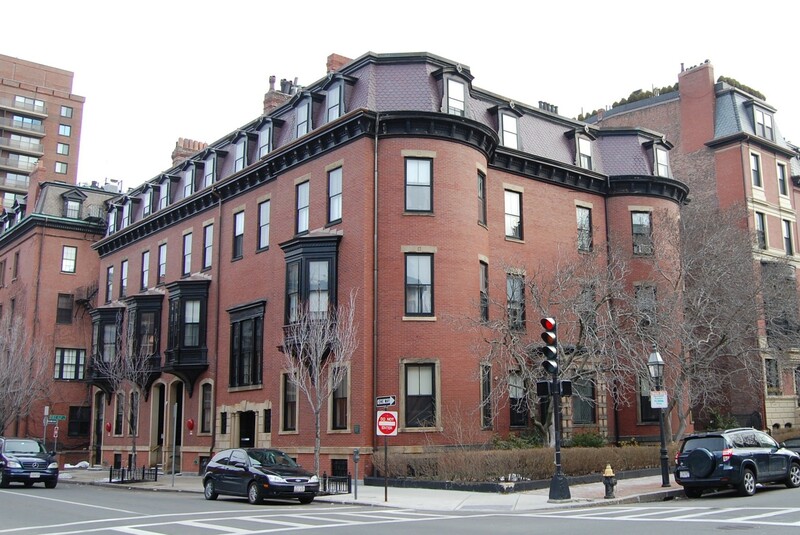 She continued to live at 273 Clarendon during the 1887-1888 winter season, but moved thereafter to 357 Marlborough. On June 12, 1888, 273 Clarendon was purchased from Sarah Cunningham by Augustus Hemenway. He and his wife, Harriet (Harriett) Dexter (Lawrence) Hemenway, lived next door, at 91 Marlborough, and also maintained a home and farm in Canton. Harriet Hemenway was the sister of Episcopal Bishop William Lawrence, whose wife, Julia, was Sarah Cunningham’s daughter. During the 1888-1889 winter season, 273 Clarendon was the home of Hannah Elizabeth Snow and Mary A. Snow, daughters of Rev. Theodore W. Snow, an Episcopal minister. They previously had lived at the Hotel Vendôme. 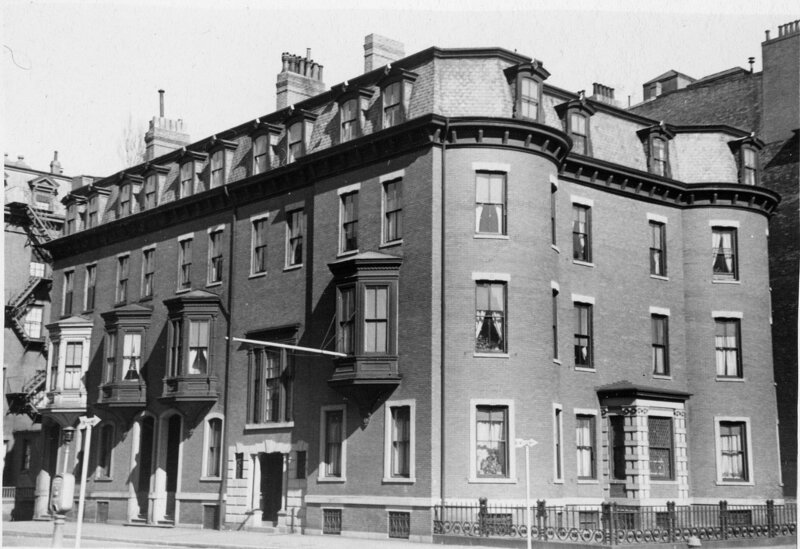 They continued to live at 273 Clarendon during the 1889-1890 season, but moved thereafter to 5 Brimmer. On January 8, 1890, Augustus Hemenway transferred 273 Clarendon into his wife’s name. Soon thereafter, they combined the two houses, converting the entrance at 91 Marlborough into a bay window and rebuilding the entrance at 273 Clarendon, which became the address of the combined property. While the houses were under construction, the Hemenways lived temporarily at 151 Commonwealth. “The home was beautifully decorated with smilax and vines and lovely roses and lilies. It was done by a decorator. The rooms were all cleared for dancing and at the back of the third room was a long counter with waiters behind it, serving sherbet and champagne all the evening. The big library upstairs was freed for sitting out and they also sat on the stairs all the way up to it. There were chairs around the dancing rooms for the chaperones and older people to sit and watch. Aunt H. and I received in the hall…”. During the 1897-1898 and 1898-1899 winter seasons, the Hemenways were living elsewhere and 267 Clarendon was the home of banker Stephen Van Rensselaer Thayer, Jr., and his wife, Julia Matthews (Porter) Thayer. 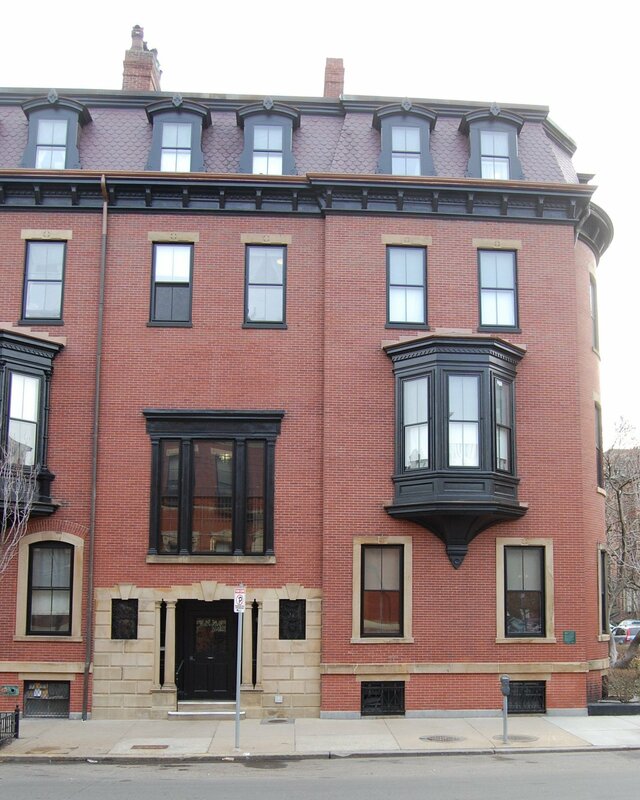 They moved to 28 Fenway by the 1899-1900 season (his widowed mother, Alice (Robeson) Thayer, lived at 30 Fenway). By the 1899-1900 winter season, 273 Clarendon was once again the home of the Hemenways. The Hemenways’ six children – Augustus, Hope, Charlotte, Hetty, Lawrence, and Mary – lived with them. Hope Hemenway married in September of 1909 to John Richardson. After their marriage, they lived in Cambridge. Charlotte Hemenway married in July of 1914 to George Parkman Denny. He had graduated from Harvard Medical School in 1913, and after their marriage they lived in Baltimore. By the 1915-1916 winter season, they were living at 285 Marlborough. 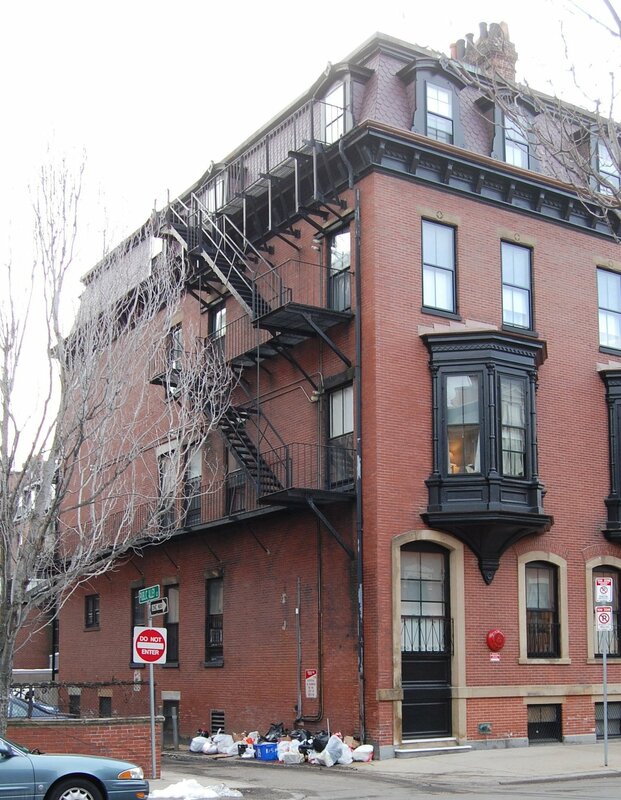 During World War I, Harriet Hemenway operated a “canning kitchen” and sold the canned goods at the rear of 273 Clarendon with the net proceeds for the benefit of war relief work. Hetty Lawrence Hemenway married in August of 1917 to Auguste Richard, who was serving in the US Army. After their marriage, they lived at 273 Clarendon with her parents. In September of 1917, she published a novel, Four Days, about wartime marriage. By 1920, they had moved to New York City, where he was a wholesale dry goods merchant and later a banker. Lawrence Hemenway married in December of 1917 to Natalie Thayer. After their marriage, they lived at 158 Mt. Vernon. During the 1918-1919 winter season, the Hemenways were joined at 273 Clarendon by George Parkman Denny and Charlotte (Hemenway) Denny. He was serving in the US Army medical corps. They previously had lived at 285 Marlborough, and by mid-1919 had moved to 3 Gloucester. Mary Hemenway married in February of 1924 to Rev. John J. Callan, a widower; after their marriage, they lived in Wellesley, where he was rector of St. Andrews Episcopal Church. Augustus Hemenway died in May of 1931. 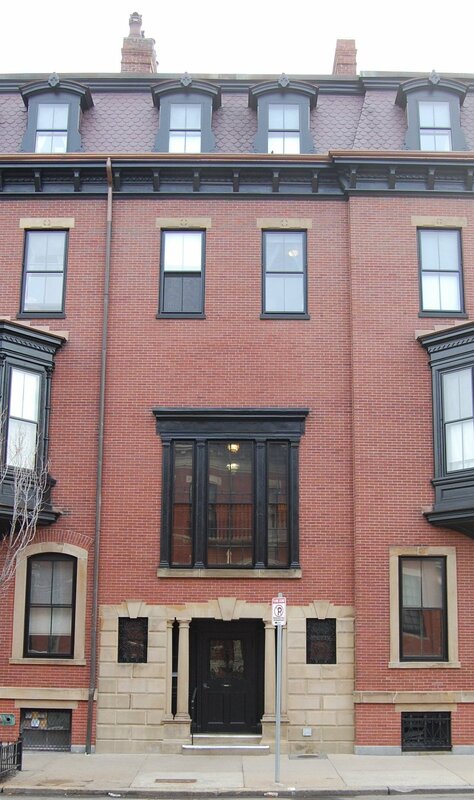 Harriet Hemenway continued to live at 273 Clarendon. Their unmarried son, Augustus Hemenway, Jr., a real estate broker, lived with her, and they were joined by the 1931-1932 winter season by Mary (Hemenway) Callen, who had divorced John Callen in June of 1931. They had moved to their Canton home by the 1932-1933 season. On December 28, 1935, 73 Clarendon was acquired from Harriet Hemenway by the Episcopal City Mission. The house was shown as vacant in the 1934-1936 City Directories. In February of 1936, the Episcopal City Mission applied for permission to convert the house into a “philanthropic home for elderly women.” The permit was abandoned, and the house continued to be listed as vacant in the 1937-1938 City Directories. In December of 1937, the Mission acquired 275 Clarendon, and in March of 1938, it the filed for (and subsequently received) permission to convert both houses into a “home for women.” The Mission called the combined property Morville House. 275 Clarendon was purchased from George Wheatland, Jr., on November 1, 1869, by Mary Louise (Gibbs) Horton, the wife of William Langley Horton. They previously had lived at 15 West Cedar. In 1871, he was a manufacturer of chemicals and colors. Clkick here for an index to the deeds for 275 Clarendon. On September 22, 1870, 275 Clarendon was purchased from Mary Louise Horton by her father, Nathan Bourne Gibbs, Jr., a commission merchant in the West India trade. He and his wife, Elizabeth Swift (Burgess) Gibbs, lived at 38 Commonwealth. William and Mary Louise Horton continued to live at 275 Clarendon until about 1872. On October 1, 1873, 275 Clarendon was acquired from Nathan Gibbs by Frederick Alexander Lovering, He and his wife, Julianna Maria (Shimmin) Lovering, made it their home. They also maintained a home in Milton. Their two daughters, Julia Eliza Lovering and Sarah Charlotte Mary Lovering, lived with them. Frederick Lovering died in February of 1885. Julianna Lovering had become mentally ill and was hospitalized at McLean Hospital, where she died in December of 1907. In his will, Frederick Lovering left his estate to his two daughters. Julia Eliza Lovering also had become mentally ill, and on July 8, 1885, the Norfolk Probate Court appointed commissioners to divide the property between the two sisters, with Sarah Lovering as guardian for Julia. On October 7, 1885, the commissioners transferred 275 Clarendon to Sarah Lovering. She lived there during the 1885-1886 season; thereafter she moved to Milton and leased 2785 Clarendon to others. By the 1886-1887 winter season, it was the home of Dr. Elbridge Gerry Cutler, a physician, and his wife, Fannie Gore (Bradford) Cutler. He also maintained his medical offices there. They had married in October of 1886, and 275 Clarendon probably was their first home together. During the previous season, prior to their marriage, he had lived at 114 Marlborough. 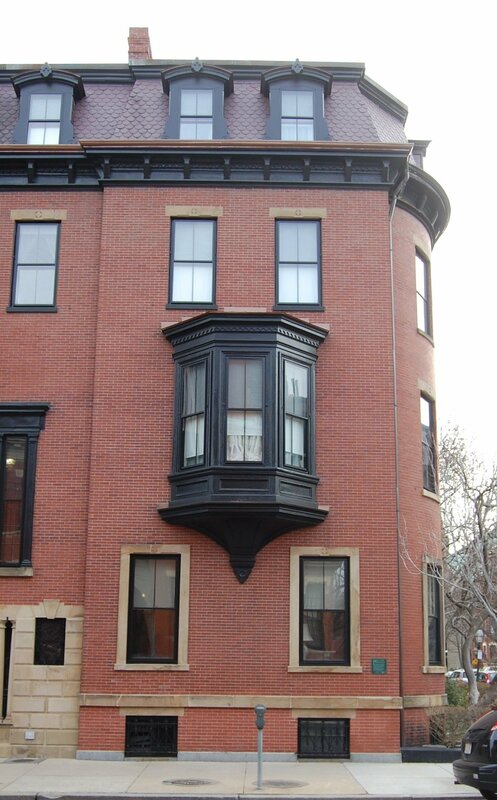 They continued to live at 275 Clarendon during the 1890-1890 season, but moved thereafter to 214 Beacon. Sarah Lovering traveled to abroad in mid-1890 and died soon thereafter, probably in Paris.. In her will, she left the bulk of her estate in trust with the income to be used for the care of her mother and sister, stipulating that half of any amount not spent for that purpose during any year would be used “for the promotion of the comfort and happiness of the inmates of the McLean Asylum for the Insane or of any of the inmates of any of the institutions maintained by the Commonwealth of Massachusetts for the care of the insane…”. The trustees continued to hold 275 Clarendon and lease it to others. 275 Clarendon was not listed in the 1892 Blue Book. By the 1892-1893 winter season, it was the home of Miss Ellen Upton. In 1889, she had lived at 171 Marlborough with her widowed brother, George Bruce Upton, Jr. Ellen Upton continued to live at 275 Clarendon during the 1895-1896 season, but had moved to 110 Marlborough by 1897, where she was living in April of 1898 when she married to George Philler. During the 1896-1897 and 1897-1898 winter seasons, 275 Clarendon was the home of Miss Katherine Silsbee. The house was not listed in the 1899 and 1900 Blue Books. By the 1900-1901 winter season, it was the home of cotton mill treasurer Charles Dale Turnbull and his wife, Maria (May) (Peck) Turnbull. They previously had lived at the Hotel Ludlow (southwest corner of Clarendon and St. James). They continued to live at 275 Clarendon during the 1904-1905 winter season, but then moved to 126 Marlborough. By the 1905-1906 winter season, 275 Clarendon was the home of Dr. Frederick Bradlee Winslow, a physician, and his wife, Mary Stedman (Williams) Winslow. He also maintained his medical office there. They previously had lived (and he had maintained his office) at 282 Berkeley. They also maintained a home in Nahant. Initially, the Winslows leased 275 Clarendon from the trust established under Sarah C. M. Lovering’s will, but on July 2, 1924, they purchased the house from the trustees. Frederick Winslow died in November of 1937 and Mary Winslow moved soon thereafter. On December 29, 1937, 275 Clarendon was acquired from Mary Winslow by the Episcopal City Mission, which had acquired 273 Clarendon in December of 1935. In March of 1938, it the filed for (and subsequently received) permission to convert both houses into a “home for women.” The Mission called the combined property Morville House. 277 Clarendon was purchased from George Wheatland, Jr., on November 1, 1869, by Sarah Elizabeth (Learned) Mifflin, the wife of Benjamin Crowninshield Mifflin, a banker and broker. They previously had lived at the Hotel Pelham (southeast corner of Tremont and Boylston Streets). Click here for an index to the deeds for 277 Clarendon. The Mifflins continued to live at 277 Clarendon in 1873, but by 1874 had moved to 260 Beacon to live with his parents, Dr. Charles and Mary (Crowninshield) Mifflin. On July 6, 1873, 277 Clarendon was purchased from Sarah Mifflin by a trust established by John Adams Blanchard (who had died in December of 1872) for the benefit of his daughter, Sarah Harding Blanchard, who made it her home. During the 1877-1878 winter season she was living elsewhere and 277 Clarendon was the home of John Heard. 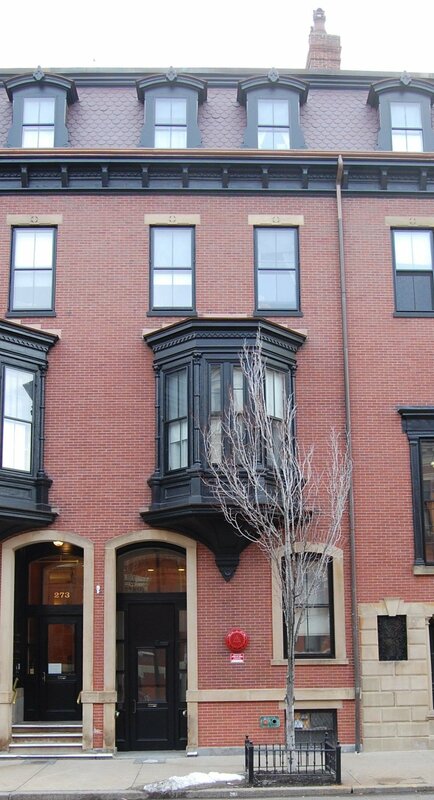 Miss Blanchard resumed living at 277 Clarendon by the 1878-1879 winter season and continued to live there until 1884. By the 1887-1888 winter season, she was living at 95 Mt. Vernon. 277 Clarendon continued to be owned by her trust, which leased it to others. During the 1884-1885 winter season, it was the home of Anstiss Derby (Rogers) Wetmore, the widow of William Shepard Wetmore of New York City and Newport, who had been a merchant in the China trade. By the 1885-1886 season, she had moved to 36 Fairfield. By the 1885-1886 winter season, 277 Clarendon was the home of Arthur Gregory Richardson, a chinaware merchant and later a real estate dealer, and his wife, Mary Sophia (Gowing) Richardson. They had married in November of 1885 and 277 Clarendon probably was their first home together. Prior to their marriage, he had lived at 146 Beacon with his parents, George Carter Richardson and Ellen (Gregory) Richardson. 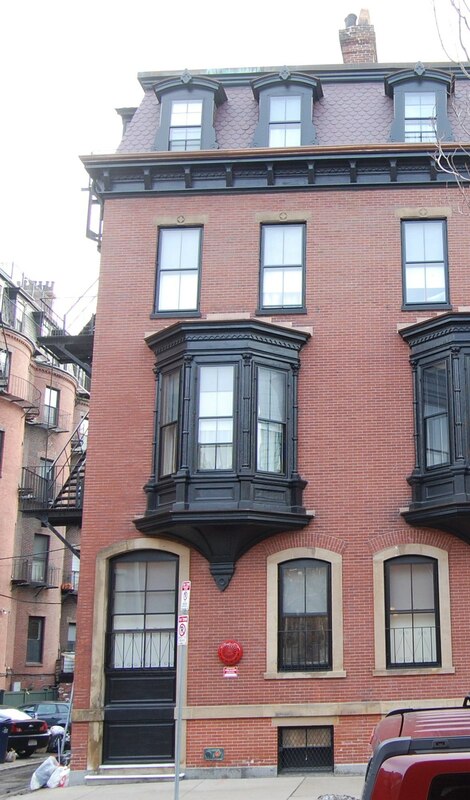 Arthur and Mary Richardson continued to live at 277 Clarendon during the 1886-1887 season, but moved thereafter and by 1888 were living in Weston. By the 1887-1888 winter season, 277 Clarendon was the home of stockbroker Allen Curtis. He previously had lived at 121 Marlborough with his mother, Maria Malleville (Allen) Curtis, the widow of Benjamin Robbins Curtis. In January of 1888, Allen Curtis married Evelyn Weston. They lived at 277 Clarendon until about 1899, but by 1900 had moved to 191 Beacon. By the 1899-1900 winter season, 277 Clarendon was the home of Rev. William Herbert Dewart, assistant minister of Trinity Church, and his wife Elizabeth Haven (Russell) Dewart. They had married in October of 1899 and 277 Clarendon probably was their first home together. In 1899, prior to their marriage, Rev. Dewart had lived at 126 Commonwealth as a lodger with Dr. Henry Cutler Baldwin, and Elizabeth Russell had lived at 135 Commonwealth with her mother, Frances Spofford (Hall) Russell, the widow of paper manufacturer and Congressman William Augustus Russell. William and Elizabeth Dewart also maintained a home in Milton. The Dewarts continued to live at 277 Clarendon in 1901. In about 1902, he became rector of St. Matthews Church in South Boston and they moved to 530 East Broadway. By the 1902-1903 winter season, 277 Clarendon was the home Dr. George Washington Wales Brewster, a physician and surgeon, and his wife, Ellen (Hodge) Brewster. They had married in November of 1902 and 277 Clarendon probably was their first home together. Prior to their marriage, he had lived at 24 Marlborough. They continued to live at 277 Clarendon during the 1913-1914 season, but moved thereafter to 213 Beacon. 277 Clarendon was not listed in the 1915 and 1916 Blue Books. By mid-1916, it was the home of Josephine Abbie (Ruggles) Harrington, the widow of Dr. Francis Bishop Harrington, a physician and surgeon, who had died in June of 1914. Prior to his death, they had lived at 285 Clarendon. Her daughter, Ruth, lived with her and on May of1916 was married to Robert Haydock, a stockbroker. After their marriage, they moved to an apartment at 52 Hereford. Josephine Harrington continued to live at 277 Clarendon during the 1918-1919 winter season, joined by Robert and Ruth Haydock. By 1920, she had moved to Cambridge and the Haydocks had moved to Dedham. By the 1919-1920 winter season, 277 Clarendon was the home of attorney Thomas Russell and his wife, Laura Loring (Parks) Russell. They previously had lived at 3 Gloucester. They also maintained a home in Plymouth. They continued to live at 277 Clarendon during the 1921-1922 season, but moved thereafter, probably to their home in Plymouth. By 1927, they lived in Brookline. On June 26, 1922, 277 Clarendon was purchased from the trustees for Sarah H. Blanchard by Mary (McBurney) Parker, the wife of Frederic Parker, a wood and coal merchant. Their son, Henry McBurney Parker, also a wood and coal merchant, lived with them. They previously had lived in Bedford, where they continued to maintain a home. They continued to live at 277 Clarendon in during the 1927-1928 winter season, but moved thereafter, making Bedford their year-round home. 277 Clarendon was not listed in the 1929 Blue Book. By the 1929-1930 winter season, it was the home of Edith Atkins (Brigham) Baldwin, the former wife of William Earle Baldwin (formerly one of the publishers of Automobile Topics weekly magazine), and their daughter, Barbara Baldwin. They previously had lived in an apartment at 333 Commonwealth. They also maintained a home in Hingham in 1930, but possibly not in later years. On May 8, 1930, Edith Baldwin purchased 277 Clarendon from Mary Parker. Barbara Baldwin lived with her mother until her marriage in May of 1948 to Coleman Ferrell Cody. Edith Baldwin continued to live at 277 Clarendon until her death in June of 1962. On November 15, 1962, 277 Clarendon was acquired from Edith Baldwin’s estate by the Episcopal City Mission. It already owned 273-275 Clarendon, Morville House, a residence for aged women, and 279 Clarendon, Morville House Annex. With the purchase of 277 Clarendon, it completed its ownership of all four contiguous properties. The first resident of 279 Clarendon was George Wheatland, Jr. – the building contractor who built 273-279 Clarendon and 91 Marlborough ca. 1869 – and his wife, Florence Saumarez (Dumaresq) Wheatland. They previously had lived in Beverly. They had moved to 265 Beacon by 1872. Click here for an index to the deeds for 279 Clarendon. In 1872, 279 Clarendon was the home of Horatio Greenough Curtis and his wife, Annie Neilson (Winthrop) Curtis. They previously had lived at 17 Charles. Horatio Curtis was a shipping merchant in the Calcutta trade. He subsequently was a sugar refiner, agent for the Pacific Guano Company, and president of the Old Boston National Bank. By 1873, they had moved to 247 Beacon. On April 1, 1873, 279 Clarendon was purchased from George Wheatland, Jr., by Miss Cora Crowninshield. She previously had lived at 89 Beacon with her mother, Harriet E. Dickason (Sears) Crowninshield, the widow of George Caspar Crowninshield. Harriet Crowninshield had died in December of 1872. In February of 1879, Cora Crowninshield married Charles Boyden, and in December of 1880, they began construction of a new home at 267 Commonwealth. He died in May of 1881, before the house was completed, and she moved there as a widow later that year. On May 31, 1881, 279 Clarendon was purchased from Cora Boyden by Caroline Abigail Brewer, trustee under the will of Gardner Brewer for the benefit of Gardner Brewer’s granddaughter, Caroline Brewer (Amory) Lyman, the wife of attorney George Hinckley Lyman, Jr. Caroline Abigail Brewer was Caroline Lyman’s maternal aunt. George and Caroline Lyman made 279 Clarendon their home. They previously had lived at 121 Boylston. 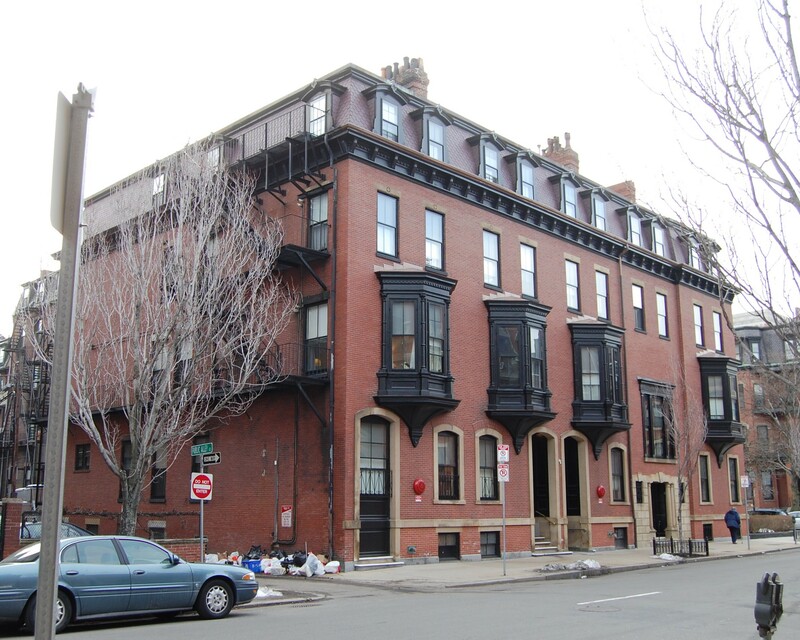 They continued to live at 279 Clarendon during the 1894-1895 winter season, but moved thereafter to 351 Commonwealth. 279 Clarendon was not listed in the 1896 Blue Book. On February 26, 1896, 279 Clarendon was purchased from Caroline Lyman’s trust by Lucy Rockwell (Bowditch) Balch, the wife of Dr. Franklin Greene Balch. They had married in November of 1894. after which they had lived in an apartment at 261 Beacon. Dr. Balch was a physician and surgeon. He maintained his medical offices at 1 Marlborough, where he also had lived prior to their marriage. He continued to maintain his office at 1 Marlborough until about 1899. In about 1900, he moved his office to 279 Clarendon; in about 1910. he moved it to the Hotel Hamilton at 260 Clarendon. He and his wife continued to maintain their home at 279 Clarendon and also one in Jamaica Plain. In about 1914, he moved his office back to 279 Clarendon. In about 1915, he and his wife made Jamaica Plain their permanent home and he converted 279 Clarendon into medical offices and at least one apartment. From 1921, the apartment was occupied by Miss Rebecca Josephine Tarr, a nurse, and probably Dr. Balch’s assistant. In 1918, she had served in the American Red Cross nursing service in France. She continued to live at 279 Clarendon until about 1936, when she moved to 324 Beacon. Dr. Balch continued to maintain his medical office at 279 Clarendon (along with various other physicians) also until about 1936, when he moved it to 330 Dartmouth. By 1937, 279 Clarendon was the home of Malcolm MacPhail and his wife, Margaret (Horan) MacPhail, who operated it as a lodging house. He was a former house painter and real estate agent, and she was a secretary. They previously had lived at 148 Warren Avenue. They continued to live at 279 Clarendon until about 1942, when they moved to 265 Clarendon. On November 1, 1942, 279 Clarendon was purchased from Lucy Balch by Edward Risegari Gai (Italo Giuseppe Risegari), an engineer. He previously had lived in Brighton. He continued to live at 279 Clarendon in 1945, but had moved back to Brighton b by 1946. On October 17, 1945, 279 Clarendon was acquired from Edward Gai by the Episcopal City Mission. It already owned 273-275 Clarendon, where it operated Morville House, a residence for aged women, and it incorporated 279 Clarendon as an annex to the facility. In November of 1962, the Mission acquired 277 Clarendon, thereby completing its ownership of all four contiguous properties.